H x W: 22.5 in. / 18 in. In 1877, a year after Custer’s death, the Nez Perce were ordered onto a reservation. Chief Joseph’s band, among others, resisted forced repatriation. They reluctantly agreed, but in the days immediately before their surrender, a party of young warriors murdered a number of settlers. Government forces were directed to restore peace. Joseph knew that the mood of his people favored war and hesitantly surrendered to their will. While he knew that they could not win against the Army, he thought perhaps they could escape. The Indians thus began their epic trek, outmaneuvering and outfighting a large contingent of the U.S. Army for months. The Army was in close, sustained pursuit, under the command of General Oliver O. Howard. With troops assigned as they could be found throughout the Western regions and from as far away as Georgia, Howard doggedly followed a day or two behind the Indians for more than 1,800 miles. However, it was Colonel Nelson Miles, who later joined The Army and Navy Club, who finally captured desperate remnants of the Nez Perce tribe within a day’s march of the Canadian border. They had hoped to seek shelter with Sitting Bull, the victor of the Battle at Little Big Horn. As it happened, half of the captives eluded their military guards and escaped across the border shortly following the formal surrender. Chief Joseph honorably chose to stay with his tribe and to share their fate in captivity. Transported into the malaria-infested swamps around Leavenworth, Kansas—far from their native land in present-day Oregon—the Nez Perce became ill and many died. In these deplorable circumstances, Joseph’s verisimilitude and righteous anger focused national attention on Congressional ineptitude and the Bureau of Indian Affairs. As a spokesman for his tribe, Joseph was without equal. He was brought to Washington, DC on multiple occasions to speak on their behalf. Eventually, the national government restored the Nez Perce to the Northwest, on land set aside in Colville, Washington and Lapwai, Idaho. 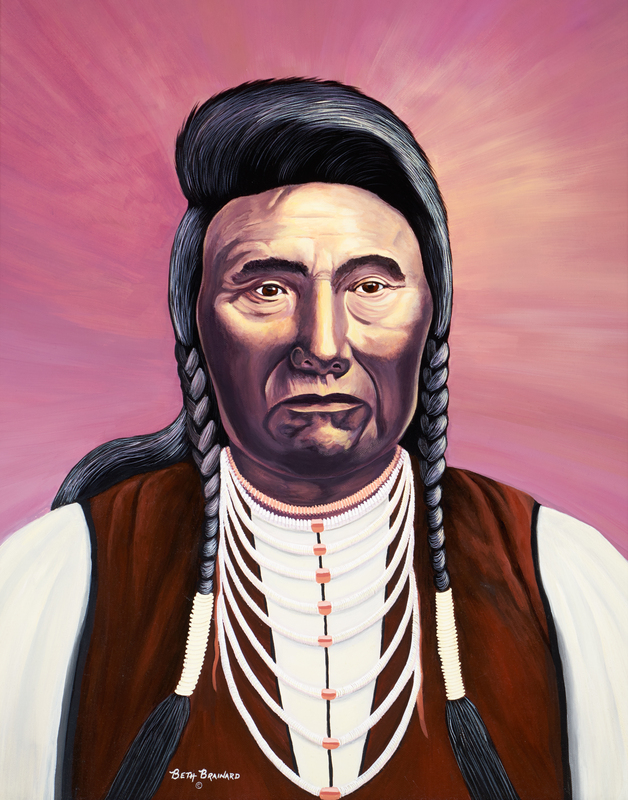 This portrait of Chief Joseph, by Pacific Northwest artist Beth Brainard, captures the heroic essence of this venerable American leader. His likeness now rightfully rests among other portraits of great national, military, and political commanders. It was commissioned and presented to The Army and Navy Club by the American Institute for Western Studies.